This article will cover everything you need to know about pocket squares, with a particular focus on history. Click any of the following links to be taken to the section that interests you most, or simply scroll down and read at your leisure. The pocket square (also known as handkerchief, pocket kerchief, and pocket handkerchief) is one of the tailored ensemble’s finishing touches that is too often overlooked. Any tailored jacket worth its salt has a breast pocket, and they are made specifically to show off some pocket linen. 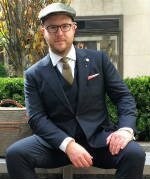 Given how easily it they add a genteel flair to your outfit, omitting a handkerchief from any outfit with a tailored coat does the wearer a huge disservice. The first linen handkerchiefs date back to ancient Egypt, where they were used by the wealthy for hygienic reasons, such as removing encrusted dirt from one’s face before eating. Centuries later, handkerchiefs retained their popularity, with Caesar dropping one to signal the start of games at the Coliseum in Rome. During the medieval period, knights would frequently ride with a handkerchief as proof of a lady’s favor. However, the handkerchief didn’t become a pocket square until the middle of the 14th century. 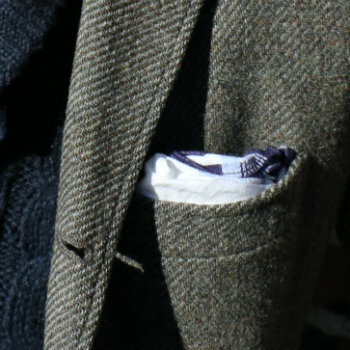 Richard II of England (1367-1400) is said to be the “inventor” of the pocket square. He kept a square handkerchief on his person at all times, using it to clean his nose and face as necessary. Maintaining an excellent appearance was required by lords and ladies, and the handkerchief was soon adopted by other nobles. The lower class caught on a few centuries later, and by the time the seventeenth century rolled around, almost everyone in western Europe could be seen using a handkerchief – though few at this time managed to fold it into a pocket square as we see done today. During the Renaissance, they were considered a functional accessory that was essential to a man’s wardrobe. Over time their designs became more and more ornate, and any man who was considered respectable carried one. They were (and, to a certain degree, still are) a symbol of social rank and gentility. Eighteenth-century England saw a rise in the popularity of snuff, wherein pulverized tobacco leaves were inhaled through the nose like one would cocaine. This offered a quick hit of nicotine and often left a pleasing aroma in the user’s nose. It also made men sneeze like hell, and the handkerchief was extremely useful in that regard. By the nineteenth century, pocket kerchiefs were in use by just about every man regardless of his social status or profession. Farmers, cowboys, and other land workers made great use of cotton kerchiefs throughout their sun-baked labors. The Duke Of Windsor popularized bright silk squares in the 1920’s, and men wore them regularly up until the 1980’s. The handkerchief fell out of favor for a very long time; Ronald Reagan was the last American president to consistently wear one before then-Vice President Joe Biden began sporting them regularly. 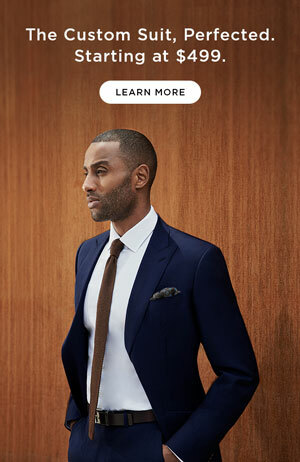 Since the early 2000’s, the pocket square has thankfully seen a resurgence in popularity. They can be bought inexpensively or at outlandish prices in a wide variety of colors, patterns, and materials. 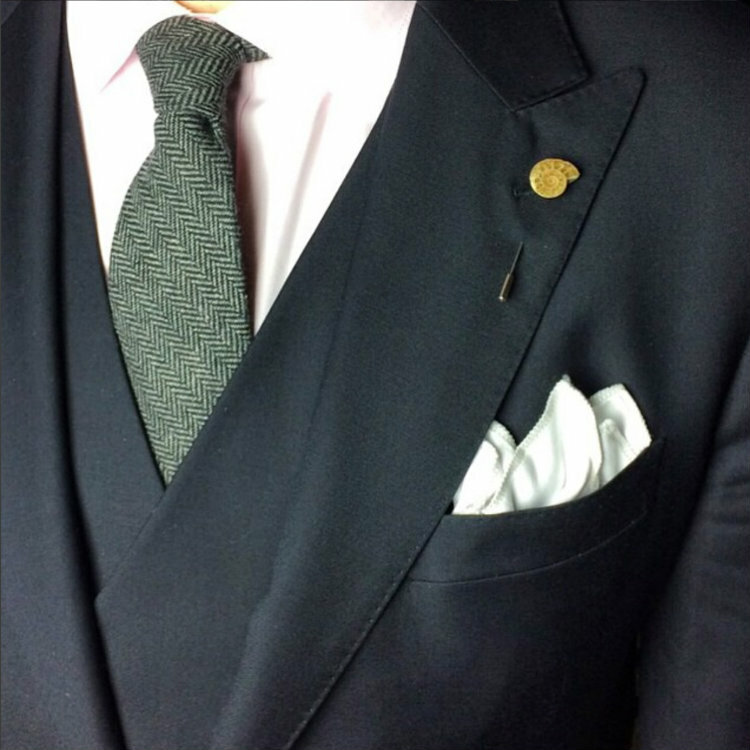 From an etiquette perspective, simply wearing a pocket square is (nearly) enough. Drinks spill and need to be tended to quickly. People cry at weddings and funerals and may not have tissues handy. You may find yourself in a vicious knife fight and have some blood to clean up. You know, typical stuff. To facilitate any of the above, the best thing you can do is abide by the “One for blowin’, one for showin'” rule. Yes, this means that you should carry two on you. One lives in the breast pocket (for showing), the other can go in a rear trouser pocket or inside coat pocket (for blowing). The square you wear for show can be as ornate or plain as you like, made from any material and in any pattern. The one in which you might end up blowing your nose? Make sure it’s cotton. You don’t need to ruin your beautiful silk kerchiefs just because you have a case of the sniffles. This begs the question, though: why do we wear these accessories in our breast pockets? Prior to making their move to the breast pocket, handkerchiefs were kept in the trouser pocket. This was for more than utilitarian purposes – it was seen viewed as a major faux-pas to expose a used handkerchief to the public. As such, men kept them hidden away, and the handkerchief didn’t turn into the more popular pocket square until two piece suits started to come into fashion during the 19th century. The major disadvantage of keeping a handkerchief in a trouser pocket was that it would touch coins, dirt, and anything else stuck down there. Essentially, the handkerchief would be dirty before it was ever used. To prevent dirtying the handkerchief before necessary, men moved it from their trouser pocket to the breast pocket of their suit. This caught on, and the pocket square was born. Note that once the handkerchief was used, men would return it to their trouser pocket. Shortly after World War II, linen handkerchiefs fell out of favor. The idea of cleaning your nose with a handkerchief and then shoving it and all the germs on it into your pocket became repulsive. Thus, Kleenex and other disposable tissue companies were formed. At this point, the pocket square mostly became a fashion statement only, no longer having any utilitarian purpose as it once did. As jeans and t-shirts began to replace suits and ties, the pocket square fell out of favor. For a few decades, you’d only find the pocket square – usually poorly folded – at weddings and proms. However, thanks to the fashion strength of GQ Magazine and television shows set in the 1960’s, such as Mad Men, the pocket square has surged in popularity. With a variety of folding styles and different materials, the pocket square has returned to the forefront of men’s fashion. There are so many tips and rules around how to wear pocket squares that we have our own page dedicated to it. We cover everything you need to know about wearing a pocket square with style including general tips, different folds, classic combinations and wearing a pocket square for specific occasions. 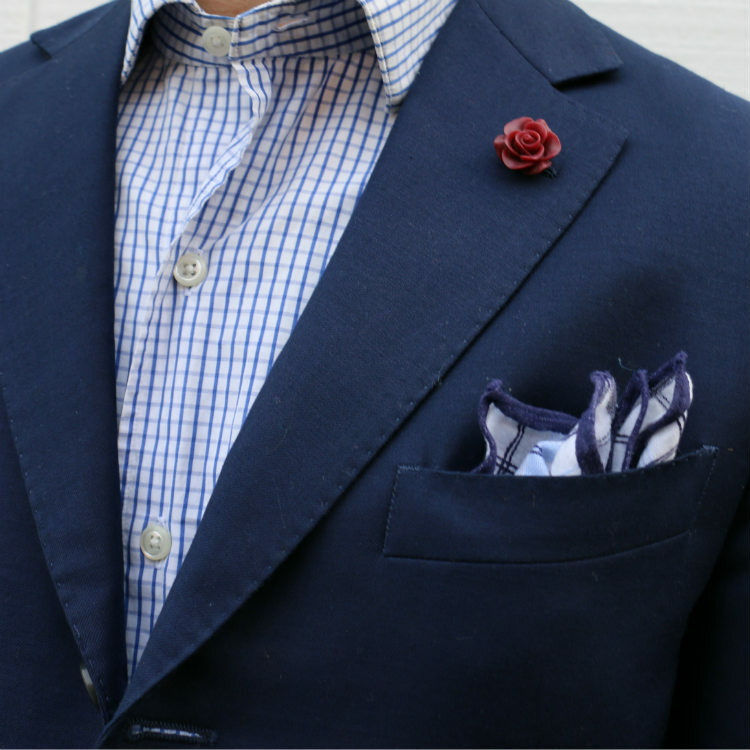 Take a look at our comprehensive guide on how to wear a pocket square for more info. They make for small details, but not all pocket squares are created equal. First, there’s the matter of size, and second, construction. The best handkerchiefs are squares that measure 16″ x 16″ or 18″ x 18″. 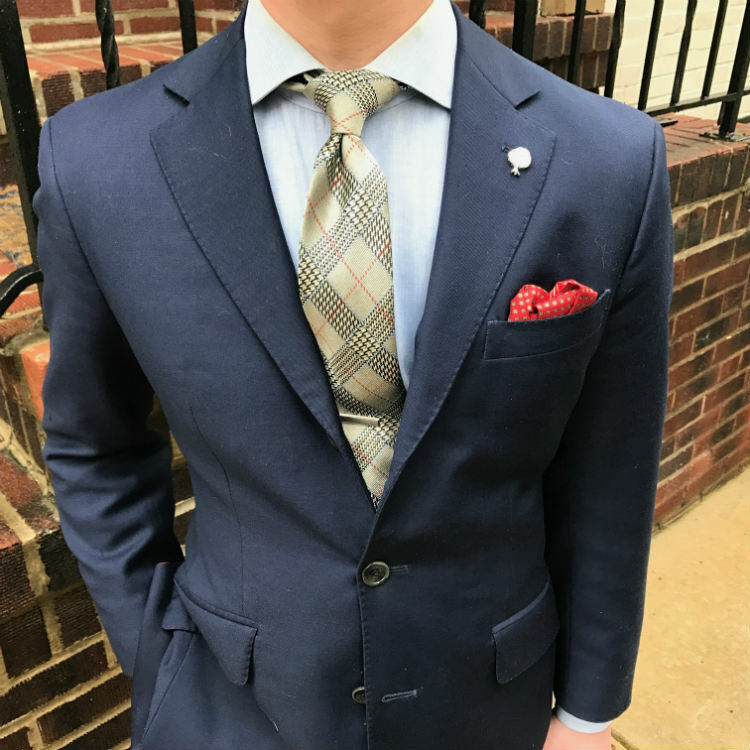 This may seem large for something that occupies a small breast pocket, but it’s important for the pocket square to have some volume, as this allows it to stay up on its own and not fall into your pocket. There’s also the question of how handkerchiefs are constructed, and the key is in how the edges are sewn: either by machine or by hand. Machine-sewn edges are cheaper because they can be made more quickly and thus less expensively. They comprise many of the pocket squares on the market and often make excellent accessories. Squares with hand-rolled edges are widely considered to be the apex of handkerchief luxury by connoisseurs. They’re considered to have superior volume to their machine-made cousins, and they command a much higher price tag for this. While it’s certainly wonderful to own as many handmade items as possible, it is neither necessary nor feasible for most men to collect only hand-rolled pocket squares. So long as it’s big enough and the material is decent, you’ll look good regardless of how the edges are finished. There are as many ways to fold a pocket square as there are stars in the sky. Okay not that many, but there are quite a few of varying complexity and difficulty, and it’s important to be familiar with at least a few of them. Visit our comprehensive guide on how to fold a pocket square where we cover more than twenty types of pocket square folds. Rampley & Co.: Rampley & Co. offer unique silk pocket squares printed with eye-catching art-work and vintage designs. They’re well worth your attention! Macys Club Room: A 13-pack of plain white cotton squares for $20. Given that white pocket squares WILL get mucked up easily, this is a great way to jump start your collection and refresh it every few months on the cheap. Fine And Dandy Shop: Fine & Dandy Shop started as an online-only operation in 2008 and opened a retail location in Manhattan a few years ago. They sell American-made handkerchiefs in all manner of colors, patterns, and materials for reasonable prices. Edward Armah: Edward Armah, in addition to making all manner of menswear accessories, makes “pocket circles.” They’re handkerchiefs in the shape of a circle that, when put into your breast pocket, have a distinctly floral shape to them. They’re truly one-of-a-kind, and we’re fans. While we firmly believe in collecting as many pocket squares as humanly possible, there’s also a ton of value in knowing how to make your own. This is a great project to repurpose your beloved but worn-out dress shirts, in particular. To learn how to create one yourself, take a look at our guide on how to make your own pocket square. Pocket squares are generally made from silk, cotton, and linen. Wool is sometimes thrown into a fabrication, and synthetic materials like rayon and polyester are used in cheap squares that aren’t worth buying. We will focus on silk, cotton, and linen here. Silk pocket squares are refined, handsome, and elegant. Available in a wide variety of colors and patterns, their “wet” texture tends to look excellent against the “dry” texture of heavy wools like Harris tweed, flannels, and Donegals. Don’t blow your nose in one of these. Cotton handkerchiefs look great with worsted wool suiting and cotton jackets. Also made in any color and pattern under the sun, a cotton handkerchief should be a standard in your ensemble not necessarily in your breast pocket, but as a functional accessory you carry in a rear trouser or inside jacket pocket. Pocket squares made of linen are the last of the “big three” in terms of material. They wear and pair similarly to cotton and tend to look best during the warmer months. You’ve probably noticed that we’ve used the terms “handkerchief” and “pocket square” interchangeably up to this point. The reason for this is that the terms are, well, interchangeable. Given that they aren’t square-shaped 100% of the time (Edward Armah makes pocket circles, for example), it’s often easier to refer to them as hankies than anything else. The biggest reason that so many men avoid wearing pocket squares is fear due to a lack of familiarity. Thankfully, wearing a pocket square is something easy to learn, though it can also be difficult to master. Take the plunge and try a simple white one first. After a short while, you’ll wonder how you ever went so long without wearing a handkerchief. I’ve always loved pocket squares, for adding extra color to a suit. My boyfriend will definitely be getting some this Christmas! Thanks, they definitely take an outfit to the next level! Sounds like a lucky guy! Wonderful article. I love how you take a look at the origins and history of the pocket square. Thanks! That’s one of the aims of Bespoke Unit, placing what we wear in historical context. Gotsome great content writers and content coming soon….so watch this space!